Ligularia - Big, Bold and Beautiful! 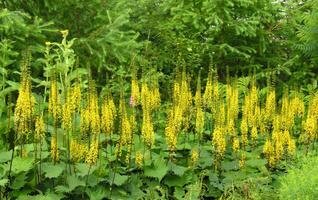 If large imposing perennials are your thing, then you must grow Ligularia. Few garden perennials offer such decorative foliage and striking flower displays. For the back of the border, they are second to none! As long as they have steady access to soil moisture, Ligularia will provide you with the ultimate plant for Big, Bold and Beautiful! As gardeners we are always on the lookout for that plant that will create an impact in the garden. 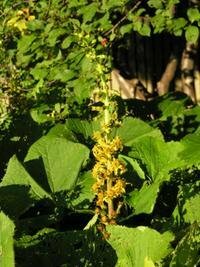 Tall plants with showy flowers and large leaves fit the bill quite nicely and one of the best plant group that encompasses this description are the Ligularia. 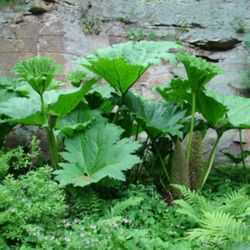 There are some 150 species in the genus Ligularia, most native to the Himalayan region, China and Japan. Only a small handful are known in cultivation and these generally are quite large plants with bold spikes or sprays of brilliant yellow to orange flowers. In the wild, they grow in damp meadows and along streamsides, so the key to success is even moisture. No plant is quicker than Ligularia in letting you know when it needs water. With the slightest drought, the leaves quickly wilt. 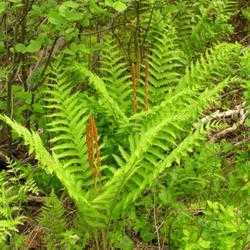 To grow these plants to perfection choose a fertile, moist spot in the garden; they can even withstand boggy soil. They are ideal for planting behind a water feature. 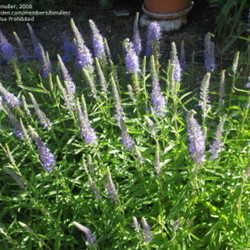 Full sun will result in the sturdiest plants but they can tolerate part-shade. The only problem with Ligularia is the fact that they are slug fodder! Their large, fleshy leaves are a slug favourite treat, so unless you have a strict regime for slug control, be content to have a few holes in the leaves of these plants. Among the popular ornamental Ligularia there are three main trends in their flower presentation; tall narrow spikes; elongated cone-shaped spikes or flat-topped clusters. 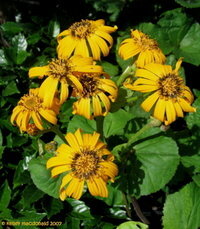 Ligularia are members of the Aster Family, Asteraceae, so the individual flowers are very daisy-like. The blooming period is mid to late summer. 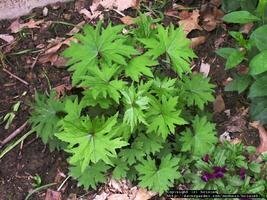 The leaves may be rounded or triangular in outline, with or without serrated margins. 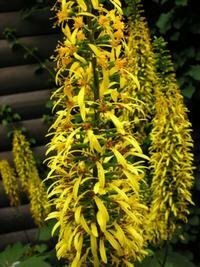 Perhaps the tallest and most popular Ligularia is L. stenocephala "The Rocket. This selection can tower to over 2 m making it an imposing plant! 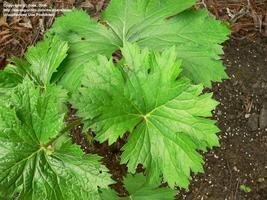 The leaves are deep green, triangular in shape with irregularly tooth margins. The flowering stems are dark purple and contrast beautifully with the narrow yellow spikes. Individual flowers are small but several hundreds are produced per spike. Looking very similar is L. przewalskii whose leaves are more jaggedly toothed than ‘The Rocket' (and I think more attractive). The hybrid ‘Zepter' is another look-alike but has huge, lightly-toothed leaves. The species L. wilsoniana produces a narrow spike but has more rounded, shallowly-toothed leaves. If space is a consideration, you can try the newest cultivar called ‘Little Rocket' that tops at 1.2 m.
Among the most popular of the flat-topped Ligularia is L. dentata. There are several named cultivars. 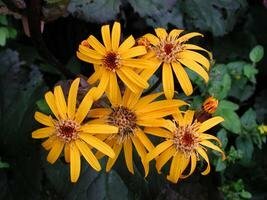 All have large, rounded, somewhat cupped leaves at the end of long stalks and stout flower stems that rise to 1.2 m. They have large clearly daisy-like flowers that are golden-yellow to bright orange. 'Othello' is perhaps the most popular. It has gorgeous dark purple leaves which contrast strongly with the orange-yellow flowers. Other look-alike cultivars include ‘Dark Beauty' and ‘Britt-Marie Crawford'. ‘Desdemona' is quite similar but its leaves are not as dark. ‘Sommergold' is a green-leaved cultivar. Ligularia X palmatiloba has rounded leaves that are elegantly jaggedly toothed and incised. Their flowers are similar to L. dentata but bright yellow. Among those Ligularia with shorter, more cone-shaped spikes is L. veitchiana. This species has rounded leaves with slightly puckered edges. ‘Gregynog Gold' is a hybrid between the flat-topped L. dentata and L. veitchiana. Their flowers are also held in a more cone-shaped arrangement. Their leaves are also round and the individual flowers relatively large and golden-yellow. ‘Sungold' is another look-alike. The hybrid called L. X hessei (dentata X wilsoniana) is quite similar. There are two shorter species with cone-shaped flower clusters: L. calthifolia and L. fischeri. These both have rounded, thick-textured leaves and only reach a little over 1 m.
One last species which must be mentioned is L. tangutica. I have not grown or seen this one other than in pictures. The leaves are deeply divided, looking almost like a cut-leaved elder! The individual yellow flowers are tiny but are produced in a large plume-like spray. It must be one of the most distinct Ligularia and among the most beautiful and elegant. For a focal point in a garden, it's hard to beat Ligularia. Even without flowers, its foliage is quite impressive. 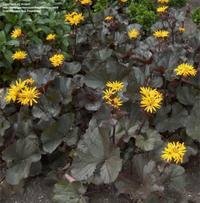 If diligent with slug control and proving enough water, you can be rewarded with healthy Ligularia, the ultimate plant for being big, bold and beautiful! I would like to thank doss, hczone6, kell and mrporl for the use of their lovely pictures which helped complete this article.